I am reposting this for my American followers who are now seeing the fourth series of Endeavour. Enjoy. Endeavour. Series 4, Episode 1. ‘Game’. First shown on the 8th January 2017 in the UK. Chronologically this would be episode 14. Directed by Ashley Pearce: Ashley Pearce is a veteran director of crime dramas on TV: Maigret Sets a Trap 2016, Agatha Christie’s Poirot 2008-2010, Silent Witness (TV Series) (2 episodes) 2004. He also directed a few episodes of one of my favourite TV shows of recent years, Downton Abbey. It is two weeks after the traumatic Wessex Raid, Joan Thursday leaving home and Morse realising he loved Joan. Fred and Win are still trying to cope with Joan’s departure as is Endeavour. Sara Vickers as Joan Thursday seen in flashback during the episode, ‘Game’. A body is found floating in the Cherwell river and is identified as Richard Neilson. Neilson was part of team who built and designed the Joint Computng Nexus – a “thinking machine” at Lovelace College. With what looks like a suicide as Richard Neilson had stones in his pockets, becomes more like foulplay to Endeavour when another body is found drowned but this time in a bath at the local swimming baths. Endeavour believes there is a connection but Thursday and Strange do not. Magdalene Bridge over the Cherwell where Neilson’s body is seen floating. While these events are happening Endeavour has to cope with having failed his sergeant’s exam. An automatic fail as his exam paper was mislaid and never reached the appropriate authorities. Meanwhile the Joint Computng Nexus (known as JCN -Jason) is being readied to compete against a Russian chess master Prof. Yuri Gradenko. Murder, chess, Oxford, mysteries and dark secrets it can only be another Endeavour episode. This episode was an excellent opener for the new series. After a few, in my opinion, lacklustre episodes in the last series, (‘Prey’ anyone), this was a great leap forward in style, writing and direction. Russell Lewis the writer of the episode has done all Endeavour Morse fans proud. I can’t imagine anyone being disappointed with this episode. The episode was beautiful in its rich, dark tones not just in the story but in its lighting and cinematography. The scares within the episode were real and visceral and never cheap. So many of today’s horror films are based on the ‘cattle prod’ jump to scare. What I mean by ‘cattle prod’ is that a scare will come out of someone jumping out in front of the screen or something dropping onto the camera. All very tedious. This episode never plumbed any such depths when it would have been so easy to do so especially when Morse and Endeavour were searching the tunnel that ran beneath the swimming baths. The abduction of Tessa Knight was subtly done but still give us all a little jump and scare. Roger Allam and Caroline O’Neill as Fred and Win Thursday were excellent as two parents trying to cope with a missing daughter and what feels like an empty house. The scenes between Fred Thursday and Shaun Evans were sublime. It was like watching a father and son trying cope with each other’s belief in their feelings of blame regarding Joan’s leaving home. I got the impression that Fred not only blamed himself but also in a small way, Endeavour. I believe Fred felt that if Endeavour had let Joan know of his feelings sooner she may have stayed. Morse was probably thinking the same thing. However, the rest of cast especially the regulars were in fine fettle especially I thought James Bradshaw as Max DeBryn. Max had one of the best lines in the episode, “This one is as ripe and runny as a rancid Roquefort” referring to the body of Richard Neilson. Of course the episode wasn’t perfect. As with some other episodes Russell can write lines that sound Miss Marpleish or wouldn’t sound out of place in Murder, She Wrote. By this I mean is that the lines are rather too obvious and signal what is coming next with the subtlety of a foghorn and disco lights. For example, when Tessa Knight says to Dorothea Frazil that the next time she will see her it will be on the front page of a newspaper one knew that she was going to be the next victim. The episode ‘Prey’ was the worst with such telegraphed plot lines. In that episode when Chief Superintendent Bright was relating his story about his encounter with a man eating tiger in India it became obvious how the episode was going to end. But putting that all aside it was a pleasurable way to spend two hours. I hope they haven’t set the bar too high with this episode when it comes to the next three episodes. The episode’s cinematography and direction reminded me of the Morse episode ‘Service of all the Dead‘. Like that episode the camera lens looked into mirrors, looked through glass often distorted and the sets and scenes were awash (pardon the pun) with a lot of reflective surfaces. Water played a major role in the episode and of course is forever referred to as looking like glass. Of course, water has many meanings from an element that cleanses, gives life, takes life. In dream interpretation water can represent an attempt to not deal with a toxic situation; to sweep it under the proverbial carpet. The crime writer Kent Finn’s latest book is titled ‘Jolly Deep Water‘. More on Kent Finn later. The episode had some lovely nods to the original Morse series which I will go into later. So my rating for this episode is 8 jags out of ten. As most of you will know Colin Dexter will not be appearing in the series four episodes due to ill health. However the producers have made sure that he appears in the episode in one way or another. In this episode Colin’s picture hangs in the office of Dorothea Frazil. The first piece of music we hear is Erik Satie‘s (1866-1925) wonderful Gnossiene. I literally smiled that this piece was played as I love Satie’s work. Probably his best known work is Gymnopédie No.1. Next up we again have a favourite song of mine. (Have the producers of the show been looking at my CD collection?). It is song by Jefferson Airplane called ‘White Rabbit‘. There is also a piece of Jazz being played when Morse visits Kent Finn’s house but it was too quiet to identify. The first quote is by Max Debryn to Endeavour when Morse enquires about his thoughts on love. Max replies, “and one was fond of me and all are slain“. I personally didn’t recognize the quote but thanks to two of my blog readers, Lazaro and Edward who pointed out that this quote is from Alfred Edward Housman (1859 – 1936). And one was fond of me; and all are slain. After JCN the computer has beaten the Russian and all the team are celebrating outside, Professor George Amory tries to get the Russian to take some champagne by saying, “Napoleon’s dictum“, (this is around the 50 minute mark). This is a reference to Napoleon saying, ‘it is better to fight against a coalition than to fight as part of one’. There are quite a few dictums related to Napoleon but I think the afore mentioned one is appropriate in relation to the cold war during the 1960s. The book is more or less about a a cynical journalist who is shipwrecked on the fictional island. “What piece of work is man” is said by Kent Finn. The quote is from Hamlet. The team behind the building of the JCN computer are based at the Lovelace College. The scenes in the college were filmed at St. Catherine’s College, Manor Rd, Oxford OX1 3UJ. Is the use of Lovelace a reference to Augusta Ada King-Noel, Countess of Lovelace (10 December 1815 – 27 November 1852) an English mathematician and writer, chiefly known for her work on Charles Babbage‘s early mechanical general-purpose computer, the Analytical Engine. The body of Richard Neilson was seen floating under a bridge at Addison’s Walk. The area of Binsey was mentioned in the episode as the place where the Leighton-Asbury family lived. I cannot be sure it was filmed in Binsey and cannot locate the house but here is a map as to where Binsey is in relation to the centre of Oxford. The opening scene was filmed in the Sheldonian theatre in Oxford. The painted ceiling is by Robert Streater. Up next is the location of the swimming baths. A huge thanks to a blog reader who goes by the name Shirewitch for telling me about this important location in this episode. The internal shots were shot at the Health Hydro in Swindon. However, I am not sure where the external shots of the swimming baths were shot. Around 15 minutes into the episode we find DS Strange and some fellow officers watching a tennis game on television. This was the Wimbledon women’s final between Billie Jean King and Ann Haydon-Jones. Billie Jean won. When Morse and Thursday decide to look for the location of a house in Binsey owned by someone with a surname that begins ‘AS’ they ask for help from the team that built the JCN computer at Lovelace College. The computer was originally designed to sort through postcodes etc. Dr. Broderick Castle volunteers to enter the information but Dr Clifford Gibbs points out that Castle had entered ‘rudrum‘ when he should have entered ‘redrum‘. Of course ‘redrum’ backwards is ‘MURDER‘. The computer has been named Jason in regards to its initials JCN. Is this in reference to the killer Jason in the Friday the 13th series of films? Dr Clifford Gibbs has on his shoulder at all times a small white mouse. This is probably a reference to the James Cameron film, ‘The Abyss‘. The character in that film was called Alan ‘Hippy’ Carnes and he also carried around a small white mouse on his shoulder. 1967 is of course the summer of love and the hippy movement is at its height. Todd Graff as Alan ‘Hippy’ Carnes in ‘The Abyss’. I believe that the chess game and situation was a nod to the man who Endeavour was named after, Jeremy Morse. Jeremy Morse was the template on which Colin Dexter based Endeavour Morse on. Apart from being a English banker he was also a chess composer. A chess composer is a person who creates endgame studies or chess problems. A lovely nod to Jeremy by Russell Lewis the writer. Ian McDiarmid as Hugo DeVries in Masonic Mysteries. My reasons are twofold for why I believe Kent is Hugo. Firstly, Kent’s knowledge and love of wine but more importantly Kent’s surname of Finn is the main character’s name from the film ‘Star Wars; The Force Awakens‘. Ian McDiarmid who played Hugo DeVries was a main character in the Star Wars universe playing Supreme Chancellor Palpatine. Tada. I am feeling rather chuffed to have seen this and I make no apologies for my boast and chuffed demeanour. Also it is almost 2am and I am knackered. I couldn’t get started on this until about 9:30pm as that is when my mum fell asleep. Meanwhile back on Tatooine I mean my blog. Oh God my geeky nerd self is loose. The nice reference to the original Morse series was the inclusion of the actor James Laurenson who played Professor George Amory. James was of course in the first Morse episode, ‘The Dead of Jericho‘ thirty years ago. Also, in regard to James Laurenson I noticed today, (5th December 2018), that there was a cheeky little reference to James’s character in Morse episode Dead of Jericho. 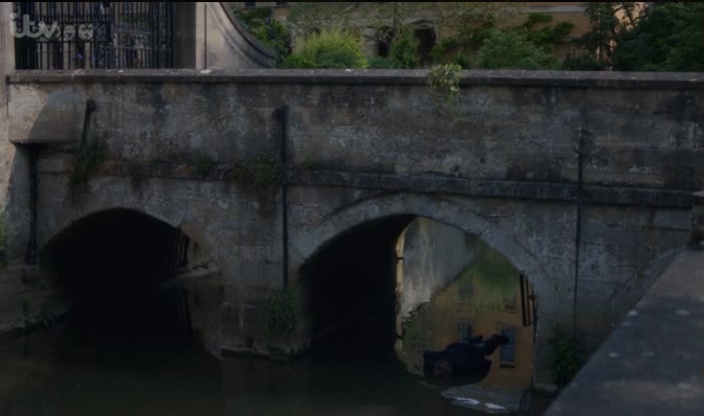 The Christian name of the body that is dragged from the Cherwell near the beginning of the episode is Richard. James laurenson’s character in The Dead of Jericho is Tony Richards. But that is not all. Watch this short video of a scene from the episode, ‘Game’ when Morse visits Richard’s colleagues. Did you see it? In regard to the flask Morse is holding the woman says it was ‘Richards’. James Laurenson turns to look at here as if he is acknowledging the name beyond the scope of the episode. Don’t know why I never picked up on that before. I don’t think there is any real need to point out that a two characters had the names of Chess pieces: Dr. Broderick Castle and Tessa Knight. One of my very observant blog readers pointed out a well observed connection: “32 minutes in after the body of Daniel is found in the swimming pool, the pool receptionist says “In 1959 nobody died, in 1960 nobody died, in 1961 nobody died”. The big question of the episode is who was the tarot card reader. I have racked my brains, what’s left of them, but to no avail. I am sure we will soon find out. Shaun Evans as Endeavour Morse. Tristan Sturrock as Dr. Bernard Gould. Ms Porfrey played by uncredited actress. James Bradshaw as Max DeBryn. Richard Neilson played by uncredited actor. Eleanor Inglis Penelope Leighton Asbury. Ruby Thomas as Tessa Knight. Ruby appeared in the Lewis (TV Series) as Kate Cameron. The episode was – Dark Matter (2010). Adam James as Kent Finn. Adam appeared in the Lewis (TV Series) as Ethan Croft in the episode – Your Sudden Death Question (2010). Well people that is it. I’m sure i have made errors in my tired state so please forgive me. I hope you have enjoyed this post and I will do this all over again for episode two. So, until then, thank you for all your support and take care. Oh as a P.S. you may have noticed I have changed the sides of the blog by the addition of photos of actors from the Morse universe. Prev Endeavour S4E1 ‘Game’: A review with Literary References, Locations etc. !!SPOILERS!! Next A Review of Morse Episode, ‘Dead on Time’. Plus the Locations, Music and Literary References. Thank you, Chris, for continuing to share your passion for all things Morse. It feels like the Endeavour premiere got lost in Sherlock’s shadow. I enjoy Sherlock thoroughly, but for me Endeavour is the superior series. Thanks Edward for pointing me towards this poem and thank you for taking the time to comment. Ah excellent Edward that never crossed my mind. With apologies, I just saw that I misspelled the great poet’s name. If you post my comments, perhaps you might delete my erroneous “e” in Housman. Thank you. Hi, Great review, like always. I wonder what’s being played in Kent Finn’s house. I know it’s a soprano sax, if I had to guess I’d say “My favourite things” by John Coltrane. Anyone to confirm that? Thanks Lázaro for pointing me in the direction of Max’s quote and thank you for commenting. I like the theory about Kent Finn. Good spot! Wonder if he’s the tarot card man. As for the computer, how about the fact that the initials ‘JCN’ are respectively one letter on in the alphabet from ‘IBM’? Then add to that the theory that ‘HAL’, the computer in 2001: A Space Odyssey got his name by going one letter the other way, i.e. backwards from IBM. The time frame of the episode would, I think, fit in with the production of the film of 2001. Add to that the first message from ‘Jason’ at the press conference, which is reminiscent of HAL’s ‘Good morning, Dr Chandra’ in the film. I also smiled at Thursday’s line about turning it off and on again . . .
A great episode. Looking forward to the next one. PS One of the quirks of Oxford is that the bridge, college and tower are pronounced ‘Maudlin’ but spelled ‘Magdalen’ . . .
Hi Ian. Regarding the misspelling of Magadalene bridge it is a lesson in not writing a post at 2am. When Thursday mentioned the turning it off and on again I thought of the sitcom The IT Crowd. Thank you regrading Hal. 2001 A Space Odyssey is one of my favourite films but it never crossed my mind regarding its first message or HAL. Thanks for commenting. As an addition to your knowledge, the swimming pool scenes were filmed in the Health Hydro in Swindon. Thank you Shirewitch that is great to know. I have updated my post with this information. Thanks for taking the time to comment. It’s a beautiful building, just saved from a hasty sell-off to developers who, no doubt, would’ve gutted it and turned it into flats. The boiler room shown is not part of the Health Hydro btw. Great article, thank you. So many facets I missed. Still, I did notice what seems to be a plot hole. Morse rules the murderer out because he and Thursday were with him the night Tessa Knight was killed. I suppose we are to assume he crept out, did the deed, and returned while everyone else was asleep, but no-one returns to the point to clarify how he was apparently in two places at once. I couldnt work out why he had a white mousse on his shoulder…..cant be Hitchikers surely…Douglas Adams went to Cambrige…!. Loved the Jefferson Airplane clip, I love that song…Brilliant reveiw/blog as always, I think you covered every aspect.., thank you……Is the painting of …Colin the one from the Randolph.?? Hi Sue. I’m not sure about the painting. I asked a friend who is also a friend of Colin and she doesn’t recognize it. I will look into the Randolph Hotel possibility. Thanks Sue. 32 minutes in after the body of Daniel is found in the swimming pool, the pool receptionist says “In 1959 nobody died, in 1960 nobody died, in 1961 nobody died”. Hi Julie. I never made the connection to the Steve Coogan character, well spotted. That is a funny scene with Steve. I have added your observation into the post. Thanks for taking the time to comment. I watched this episode for the first time the other day and the “no one died” scene made me laugh out loud because I love The Day Today and I spotted it immediately. I came to the blog to share my exciting discovery only to find you’d beaten me to it – a year ago! Well done! Dear Christ, I wonder… There is a possibility that the actress without credit could be Monica Dolan. If I rememeber well, she was Cora and Ms Gilchrist in Poirot’s episode ‘After the funeral’. Hi Arantza. I have had a look at Monica Dolan’s picture and I think she is too young to be the uncredited actress if it’s Miss Porfrey you are alluding to. There is no mention of the role in Monica’s IMDB. It was “Palfrey,” according to my subtitles. My wife’s surname is Pelfrey, so I was tickled by the bathing ladies’ surname. Hi Chris…that painting…Looking at my notes for Hairy Bikers Pubs that Built Britain. ( Oxford)….the boys were given postcards of a painting of Colin…I didnt record the show, so cant be sure….memory says it was the same…Painted by Celia Montague, on loan from the Randolph…. As I remember in the part played by Ruby Thomas in Dark Matter, the character was much the same. Full of herself and wanting her own way without too much regard for others. She was Jez’ girlfriend, right? The episode was where I first heard that nickname. We don’t use Jez for Jeremy over here, and that was part of the ‘reveal’ in Dark Matter. Thanks for staying up late and writing this. I read it out loud to my husband and we both enjoyed it immensely. 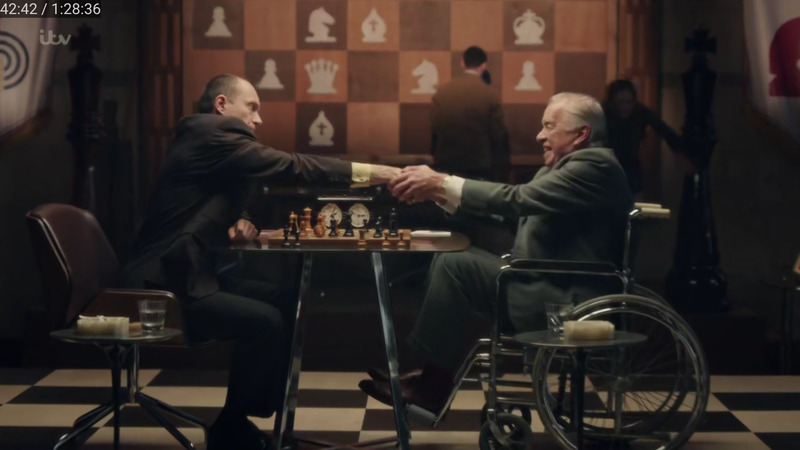 Trewlove mentions the Kronsteen Gambit [or something similar], which has to be a reference to the chessmaster character in From Russia With Love: https://www.youtube.com/watch?v=mB25sTdXkM0 – note the giant chess board on the wall in that clip, look familiar? Nice job as usual, Chris. Thanks! While I realize they are trying to build Trewlove’s character, I think Morse would have figured out the chess moves from the lockers (even I got the coordinates as a chess clue, and I’m no chess expert) as well as being able to roughly translate the diary. But I suppose they are trying to show team effort at work. One other small pet peeve was the cigarette case…when Max hands Endeavour the cigarette case… wouldn’t it have been soaking for about a month? It looked pristine. 🙁 Same for the papers that Trewlove was holding. While I realize they are trying to build Trewlove’s character, I think Endeavour would have figured out the chess moves from the lockers (even I got the coordinates as a chess clue, and I’m no chess expert) as well as being able to roughly translate the diary. But I suppose they are trying to show team effort at work. It is performed by HOPE ENSEMBLE. What a great intro piece with all the watery intonations to make the them of water so evident…Thanks again for your great blog. Hello and welcome to my blog. I hope you find plenty of interesting things here to entertain you. Sorry I’m a little late to the party…..The Abyss movie photo……that isn’t a mouse 😉 white mice, computers, old chess computers it’s 100% Hitchhikers. Certainly no need to change your post Chris it a great movie. For those that don’t understand and haven’t read DA’s trilogy in five parts, white mice built a computer to answer the ultimate question it was called Deep thought. An IBM computer that beat a chess grandmaster was also called Deep Thought (named after the hitchhikers computer). So the white mouse could be looked at as more of a computer engineer than a pet. I don’t suppose there is any reference to 42 in the computer scenes, unfortunately I deleted the episode so I can’t check. That is not Magdalen Bridge, neither in your pictures here, nor on television. It is a bridge within Magdalen College which carries a path over a minor branch of the Cherwell. Magdalen Bridge carries the High Street over the entire Cherwell valley before dividing into London Road, Cowley Road, and Iffley Road. Hi Rox. You’re right of course. I will correct it when I get the chance. Thanks. The gates on the left are a bit of a giveaway ! Would they be opened every time a double-decker bus goes to Cowley, or a coach arrives from London ? Hi Chris, I probably should of been clearer regarding your film reference above. Alan ‘Hippy’ Carnes pet in The Abyss was a rat not a mouse, different species and not particularly small when compared to Dr Clifford Gibbs’ tiny pet mouse. As this episode had a white mouse and a large old computer playing a chess master I wondered for my own amusement if there was any reference to “42”. The number 42 is the “Answer to the Ultimate Question of Life, the Universe, and Everything”. There was no 42 to be found in any of the computer scenes which on reflection isn’t that surprising as it would of been a little obvious. As a last resort I decide to see if anything of interest happened at exactly 42 minutes into the episode (my video had been expertly edited of adverts) and again nothing. But to my surprise at precisely 42 minutes and 42 seconds the Russian chess master reaches across the board to shake hands as J.C.N. has just won. Up there with the best conspiracy theories…….almost certainly…….coincidence…….probably…….but you never know. Hello, Chris. Excellent blog, I’ve only recently discovered you though, sorry. I watched this episode last night as I got the Series 4 DVD yesterday morning. I really loved the opening music, I’d heard it a few times before but didn’t know what it was called, so thanks for enlightening me. It’s the saddest and most beautiful piano music in my opinion. Also was amazed at the reference to the swimming pool sketch from The Day Today. (“In 1959, nobody died, in 1960, nobody died…”) Armando wrote The Day Today sketch and Roger Allam played a character in Innucci’s show The Thick of It. Interesting theory regarding Kent Finn and Hugo DeVries. Adam James and Ian McDiarmid even look quite similar! Keep on the good work, I look forward to reading your other blogs after I’ve watched the respective episodes. Hi Richard and welcome to my blog. I hope you find much to interest you here. Hi Chris – I ran into the following fascinating article “WORLD WAR I: 100 YEARS LATER Faces of War,” which seemed so relevant to this episode GAME. I thought you might find it interesting as well. If you already have read/seen it, please pardon me for wasting your time. Thanks, as always! Hi Jean. Thank you for putting me onto this article. Fascinating article and doesn’t that picture of the masks on the wall look like the wall of masks in the episode. This episode was shown on Finnish television on last Saturday. I found your interesting blog accidentally when searching info about the bath in this episode. As I noticed the chance to comment, I just want to mention that the short pumping station (where Edison Smalls worked) shootings were done at Kempton Steam Museum. Thanks Katrina, I will add that information into my post. The moves of the locker keys were the Kings Gambit. I found the recognition of algebraic notation by Trewlove for the locker keys a little unlikely as the computer was using English notation or English descriptive notation and until the 1970s, at least in English-speaking countries, chess games were recorded and published using this notation and Trewlove would have learnt that notation. In the game itself it wasn’t Queens Gambit as Black’s first move was not P-Q4 but N-KB3 and then White P-QB4 and Black P-K which is the Indian Catalan Opening. The checkmate move looked unlikely to me as the White pawn could have taken the Knight unless the King was in check by the Knight. But why did the King move to N3? Highly unlikely for a grandmaster to expose his King on the Rook’s flank! Long while since I saw this episode now but I have a feeling the outside location used for the swimming baths maybe Arthur Hill Memorial Baths in Reading now sadly closed and with a future unknown, if you google it and go into images you might be able to compare if you have a recording of the episode. AS an aside Monica Dolan certainly isn’t the uncredited lady, apart from anything else I’d imagine she’s much to successful now to have a tiny uncredited part. Hope she does appear role at some point truly talented actress (not a star) who knows her craft. No-one appears to have mentioned the big, big flaw in the plot from the point of view of being true to reality. Who are those musicians that Morse is listening to in the beginning? I’m afraid I don’t know. I did try to find out but as yet to no avail. So, we know at least one of the members, Loup Barrow, whom you could contact if you’d like to do a further investigation! Thanks Jean. Never apologise for not only joining a conversation but helping to answer a question. Hi Chris, thanks much for your comprehensive work. I see now your James Laurenson connection had already been made earlier. So I apologize for posting a redundant note in the wrong spot. I personally entertained the notion that doomed and uncredited Ms. Porfrey was played by a visit from a particularly age made-up Ms. Nicole Kidman. Not much proof of course – only the eyes are the same. Hey so this is a lovely page, and I’m pleased to see such detailed breakdowns, but do you think that Napoleon’s Dictum, “In victory, you deserve champagne, in defeat you need it” could be the one referenced? It seems more appropriate, given the context. It could very well be Tyrone.